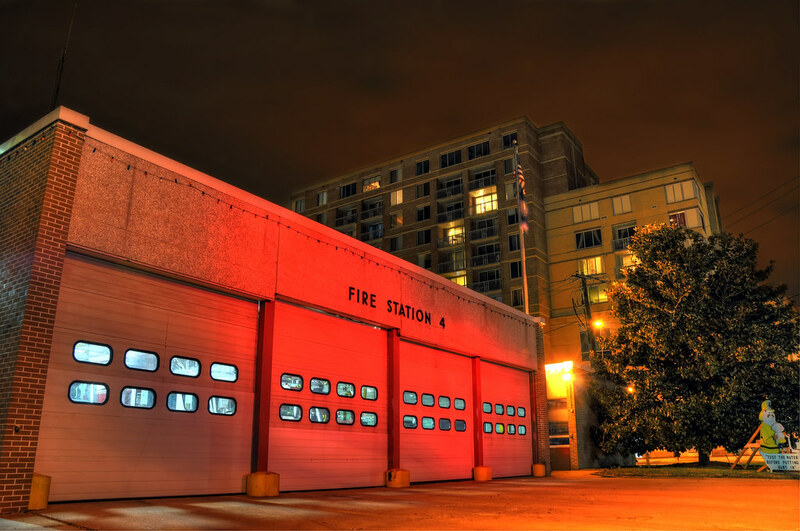 Right down the street from where I live is one of Arlington’s fire stations. Whenever I drive past it at night it always catches my eye because of the brilliant red hue imbued on it by the adjacent traffic lights. I find it slightly ironic that the facade of this building dedicated to public safety looks so evocative of fire and danger. I’d been meaning to shoot this building for a few months and finally got it while I was wandering around with my camera around midnight; what I’d love to get next is a shot of the station with the bay doors open. I hear sirens going by my apartment all the time, so at some point when the engines roll by I’ll have to grab my gear and camp outside to await their return. Side note: There seems to have been some kind of infant bathing safety campaign going on outside the station at the time I took this photo, visible in the bottom right. Some readers may be familiar with the characters. When did Peter grow a ‘stache? So weird that a fire truck parked outside our place the SECOND you published this! great photo this week. love all the lighting.